[Steemgig] *6* magic gigs in a week! So, how did it go? Finally, I feel like I've had a chance to catch my breath from the last couple of weeks. You might recall that I had a pretty big week not too long ago! The TL;DR was - I thought I performed very well. 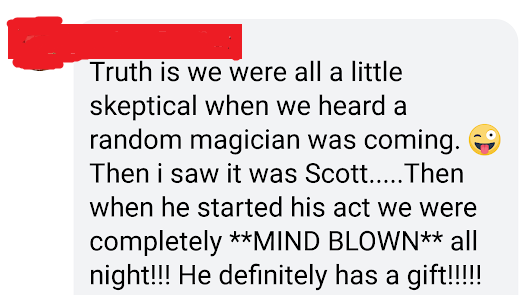 I had people blown away by my magic performances. However, not everyone was happy, and genuinely angry about me. Follow me on the flip side. First, let's talk about the good news, shall we? I can't believe I had 6 events - one of them non-paying, but business-oriented. The other five were paying gigs. A local business-to-business convention, where I went around talking to local businesses about how they could help me. (Like, for instance, printing and advertising services.) I also went around to find different companies that might be in need of my services. I even performed some of my strolling mentalism to get the crowd warmed up. A very last-minute request for entertainment at a Cub Scout Blue & Gold Banquet. There were probably about 50 people present, and I performed my standard "family show". Because I was so busy, I tried to find someone else to perform in my place, but none of my magician pals were available. I could not stand for the idea of the Cub Scouts being disappointed, so at the last minute I threw myself on this one. It was a very enjoyable crowd. Immediately after the Cub Scout banquet, I drove 45 minutes to a rural high school for an after-prom party. In addition to my strolling mind-reading act, they wanted a full show at 12:30 am through 1:30 am! There were actually some kids that stuck around for the whole show, which is really something at that hour. I also, genuinely freaked some people out with my walk-around stuff. Fun! I had a stand-up act at a bar. The bar paid me and one other fellow to do an hour of magic. We added value by warming up the crowd ahead of the show, doing close-up tricks for the crowd before the show, and talked to the fans after the show. Several people came up to me afterwards and told me how blown away they were. So, mission accomplished there! 5. Immediately after the bar show, I raced back to town, where I had one additional after-prom strolling magic gig. Again, minds were melted, 'til 2AM. I had one family friend of me and my wife who saw me here, and was blown away! 6. An evening stand-up mentalism show for Purdue students, as part of a club's year-end banquet. I also performed a little strolling close-up mind-reading here. OK, out of those six events, where do you think the problem came? Everyone seemed entertained and happy, right? Well, the problem came from gig #4. The lady hired me on Gigmasters for a rural Indiana bar for a fair bit of money, and confessed that she had a higher budget than that. She wanted an MC, and I had a buddy magician in the area who agreed to help for the additional difference. I paid the $25 Gigmasters fee for booking the gig through them (in addition to the $250+ it costs to be on Gigmasters in the first place). As it turned out, attendance was sparse at her event. Only 15 people showed up. Maybe the marketing of the event was not what it needed to be. Also, there was a tragic death in the community earlier this past week, where a guy about my age was killed in an construction accident. He was also from the same high school about 5 miles away. According to reports, other restaurants were suffering losses last night, and they assumed it was the funeral. People just wanted to mourn at home on Saturday night. 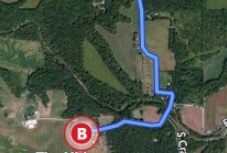 Not exactly an easy place to get to on the country back-roads of Indiana. In addition, people were paying $20 a pop to get in the door to see us. Am I worth $20 apiece to see me? Yes. I am sure the people that came got $20 of value out of my show! Audience members were gushing about how awesome the show was. But I think that the $20 that might have been a stiff barrier to entry if you don't know a guy. It could have been a Las Vegas headliner like Mac King [video] and I do not think they would have had more than 20 people. That being said, the crowd was on fire. Laughing at all the jokes. Gasping jaw-open at all the amazing parts. Lately I've been doing mentalism to try to find my own shtick and performance style, which could be a little cerebral and less flashy than some magic. However, people were coming up to me afterwards about how amazing it was. I stuck around and talked to the crowd for 30-45 minutes after the show. And me and my MC did close-up magic for the hour before the show. My MC and I both performed about an hour of strolling magic before the show. The local guy I hired as an MC did a great job (I thought). He is mostly a balloon guy nowadays, and I think he mentioned that to the staff. This morning I got a very disappointed email from the hiring party. She intended the email complaint to go to Gigmasters, but accidentally emailed to me instead. It was also fairly scathing to the MC I brought, who performed about 15-20 minutes at the beginning of the show. The email disparagingly called him a kids' show performer. The stuff that he performed wasn't kiddie stuff, but it was prop oriented, and I thought it contrasted well with what I did, which was almost propless. It was well done! In the end, her assessment of me to Gigmasters was: "He wasn't worth it!" So... in the end: I know I performed well. The lady who hired me lost quite a bit of money on the night. She had also hired staff. She had food set out for patrons who never came. She hired a sound guy for an almost empty room. She's sore about that. That's understandable! If I give her back the money, I am out the sacrifices I made. Fees to Gigmasters. I hired the MC and I brought my own assistant in addition to the MC. Cost of my own gas and time. I also bought drinks and food at the bar for my crew. I paid for all of these incidental costs which make me a pro magician: Insurance, website, training, tricks, and hundreds of hours of practice, et al. I even hired @keciah to assist me with raising my social media presence on the web. I love performing, but there is a downside. So, what would you do in this kind of situation? I'd be interested in any words of wisdom in the comments below! Map from from Bing maps. Not sure I'll refund the money, you rendered a service to her and she paid for the service. Besides, you said the crowd loved your performance so I don't see the need for any refund, because it's the crowd you came to perform to. At steemit as in real life out, doing what you love to do, your passion is key to enjoying the experience. I am glad you are doing exactly that. Great to see you doing your personal passion.